In the world of motivational speakers there are a few bright stars and of those perhaps the brightest has been Zig Ziglar. 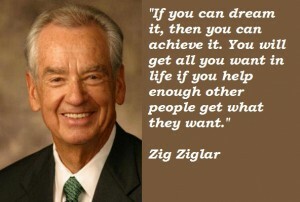 Born Hilary H. Ziglar somewhere along the line he was crowned with the name Zig, and it stuck. Born of humble beginnings in Alabama, his family moved to Yazoo City, Mississippi “where many people claim to be from, but I really am” as Zig would so often put it. His large family, he was the 10th of 12 children, struggled through the depression which was the foundation of a work ethic that lasted his entire life. Zig’s autobiography covers his 86 years in just over 230 pages with his trademark folksy charm, dry, sometimes corny wit, and poignant stories of life experiences that illustrate some point. The book is a quick and easy read as you travel back in time through an America that faced the Great Depression, multiple wars and a racing economy. I found this life story to be an engaging and charming read, sometimes repetitive in places, but overall a book that is a window into the soul and mind of a man who reached and taught millions over his long career as a motivational speaker. For those like me, who are students of the inspirational and motivational leaders, this is a must read. The honest retelling of his struggles in both the world of sales and business, that led to his launching a speaking career and then formed the basis for his talks is crucial to understanding the man. It’s easy to see just the glitz, glamour and big paychecks of being a top rated inspirational, motivational and keynote speaker. It’s rare to see behind the green curtain and realize the struggles it took to get there. His charitable works extend to his leadership role with the National Speakers Association in the early years, as a leader in the Southern Baptist Convention and in teaching Sunday School regularly after his acceptance of Jesus Christ as his lord and savior. No life is all sunshine, and Zig unflinchingly relates the loss of a child, and his personal struggles with find a relationship with God. His honest sharing of job losses, failed businesses and personal comeuppances makes this man highly relatable. I recommend this book wholeheartedly for anyone looking for a good story, and excellent motivation, all wrapped up in the love story of his relationship with ‘the Redhead’ as he lovingly calls his wife Jean of over 50 years.